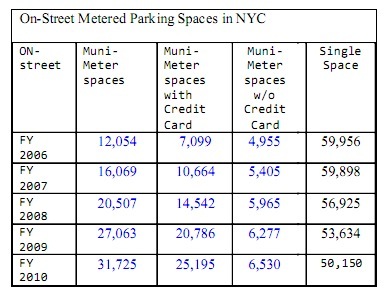 Today’s New York Post story about City Council Member David Greenfield’s desperate push to squeeze a few more parking spaces out of New York City curb space reminded us of this neat little chart, which shows the total number of parking meters in the city, broken out into single-space meters and muni-meters. If Greenfield and other council members want to get serious about opening up curb space, they need to take a hard look at these numbers. That’s an incredibly small number when taken in context. There are between 3.4 and 4.4 million on-street parking spaces in New York City, according to an extremely rough estimate by parking policy expert Rachel Weinberger, based on her field work in Park Slope and Jackson Heights. Using those numbers, only 1.9 to 2.4 percent of all on-street spaces have a meter. Everywhere else, drivers can store their private vehicles on valuable public property at no cost, moving them only when alternate side parking rolls around. That’s an enormous giveaway of public space, and it also makes it harder for drivers to find parking. As long as there’s no price on so much scarce curb space, the search for an open spot is going to be pretty tough in a lot of neighborhoods. Of course, it’s almost as scandalous that no official count of on-street parking exists. San Francisco became the first major city in the nation to tally all its parking last year, but New York has not followed suit. Right now, the city is turning to the private sector ostensibly to get as much as it can out of its parking infrastructure. Truly maximizing New York’s valuable curbside space, however, seems like it will be impossible as long as the city leaves some 98 percent of it completely unpriced and untracked. I would argue that metered street parking is only appropriate for retail/commercial districts where the high-turnover of curb spaces is desirable. Residential streets, which I would guess account for the majority of those un-metered spaces, would not be well served by parking meters. What these streets need is permit parking, where residents of the neighborhood can pay monthly or annual fees for the right to use curbside space on residential streets. Of course, given that NYC can’t even prevent parking placard abuse now with a relatively small number of legitimate placards in circulation, it strains credibility that parking enforcement could handle the deluge of parking permits that would be created with such a scheme. What would be really great is to give the traffic agents some teeth so they don’t have to be afraid to enforce parking regulations. the rest will skedaddle and free up parking spaces. In other words, assholes with two jaguars will be able to find a space and can stop blaming bike lanes for their problems. J:Lai, have you ever lived in a town / city with permit parking for residents? They are hellish systems to be avoided like the plague. Good luck even getting one, I had to wait a year and a half when I lived in Montclair, NJ to park legally. And even then, it was in a garage where the parking was only overnight (you had to be out of there by morning, even though locals didn’t use the deck all day), a garage that took up valuable real estate and was a mile walk from my home. Obviously, there isn’t enough room for everybody in NYC to own a car, but I think people are getting that, and permit parking isn’t a solution for providing more or “fairer” parking. In addition, permit parking for residents doesn’t help you free up curb-side space in major retail areas, it does the opposite. And in places like Manhattan, many major retail areas are also major residential areas. We commentariat members have already covered residential parking permits (RPP) in Streetsblog quite profoundly. Billy Gray, your experience just indicates that the permits were underpriced. One of the commonsense proposals that kept coming up at Community Board 8 transportation committee meetings was large buildings, especially those with 60+ units and doormen, asking to have just 5-6 feet in front of their building for a loading zone / pick-up drop-off area. Many buildings kindly ask as a courtesy that drivers not park there, but to paraphrase NY Magazine: only suckers fall for that. It seems like a reasonable request, but the board had a standing policy to not “giveaway” special curbside spots. A 15-minute loading zone in front of large multi-unit buildings makes sense. It would be a more efficient use of space than one long term parking spot and would help ease congestion since there would be less double parking. I would let those buildings lease that precious space in front of their building from the city at a modest cost – maybe $100/month. Maybe $250…or whatever the private garage rate is in that area. Let’s say 1,000 buildings sign up for that at $250/month. That’s $3 million a year. In Manhattan alone there are probably thousands of buildings that would love to clear that spot in front of their awnings. Owing to an unusual confluence of events, I’ve had the (mis)privilege of keeping a car in NYC for the last month. One of the things I have been consistently shocked at is the irrationality of NYC parking policy. In other words, here is what I am trying to say: Parking reform isn’t just good for livable streets, it’s also good for drivers. 1. “Free” spaces in almost all neighborhoods are underpriced for at least part of the week. That means that almost any trip by car needs to include a 10-30 minute margin for parking cruising. This is worthwhile because the cost of parking a minivan in a garage, even for a couple of hours, can easily total $30 or more: Your time has to be extremely valuable, over $1/minute post-tax, not to justify cruising. 2. The time limit on metered spots is ridiculous, especially in places where there are regularly plenty of free meters. The time limit itself is never enforced that I can see, so all it serves to do is create an irritation whereby drivers have to go and feed the meter. IMHO best thing is to ditch the limit, let drivers buy as much parking as they want, and charge accordingly. 3. High taxes on garages and other restrictions on off-street parking, without coincident pricing of street parking, encourages cruising. 1. They create serious problems for visitors from out of town, who in many cases are more likely to drive than residents themselves. 2. Unless there is a substantial charge associated, they don’t actually address the scarcity issue, just create more bureaucracy. Better would be to just charge, without worrying about administering the permits. The time limits are one of the reasons there are plenty of free meters. I have seen time limits enforced, I also see them regularly enforced in commercial loading zones (strictly to generate revenue, not to actually free up parking). Sure you could squeeze an extra hour or two over the time limit and most likely get away with it, but I think if you parked at a meter all day, you run a decent chance of getting ticketed, depending on where you are and the level of parking enforcement in that area. I remember attending the Residential Parking Permit workshop in Park Slope that was convened when the Mayor thought he could get support for Congestion Pricing by establishing RPP zones in the peripheral areas. It came to nothing but something was learned. For example, everyone has different understanding of how it would be implemented. The woman next to me at the meeting argued that her car warranted a permit even though she registered and insured her car on the Canadian border in upstate NY. I said she and all the Pennsylvania plates would have a problem, especially when her insurance company got that information. In a way, RPP would have solved the lack of local parking quite quickly. I also read Dr. Shoupe’s book and maybe I took some ideas away from it others here didn’t. He really is aiming at commercial/retail space. With the technology available today, here and elsewhere, it’s doable. Acceptability is another hurdle. How to treat with “spillover” into peripheral zones would be difficult. I found little in the book about the need for charging in residential areas that are not peripheral to daily business districts. There would be no incentive to charge for what is not full, not in real demand or needs rationing. RPP with a nominal charge, returnable to the neighborhood would suffice, and be accepted by the general public. We can, of course, argue about who should hold the proceeds, community groups or the adjacent property-owners with the direct responsibility-by-law to maintain the walkway and 18 inches into the roadway–all City-owned. Conflicts always arise when real money appears on the horizon. Quick question about the 12% growth over time in the number of metered-spaces on the chart above: How much is actual growth in the amount of curb-space with meters, and how much is growth in the number of vehicles that can be accommodated because muni-meters permit more vehicles in the same amount of space? Last year I upgraded from NYC to Philly, and I was at first skeptical of the residential parking permit system here but now appreciate its many virtues. One biggie: you’ve got to make your car LEGAL to warehouse it on the streets in your neighborhood. That means no North Carolina tags, no registering it at your brother’s address in the ‘burbs for cheaper insurance, and no renewing your permit if you have 3+ outstanding parking tickets. If New York driver-scofflaws had to absorb all those costs, not a few of them would find car ownership no longer worthwhile. Driver: I think it would be more efficient for everyone involved to do away with the time limit and raise the price as much as necessary in order to ensure that some free spots remain available. Tom: There is a parking crunch even in 100% residential areas. The city should charge for parking at times and places where you have to cruise for a spot, even if they are residential. I don’t understand why that would be a bad thing. There is no parking shortage in parts of Bay Ridge, Brooklyn and most of Staten Island, to give two examples. These areas are low density and have lots of off-street parking mandated through zoning regulations. The logical thing to do here is to allow street parking for a payment in lieu of building off-street parking. Give developers the option of paying, say, $5,000 to the city per parking spot instead of making them spend $30,000 a pop off the street. Of course, this would require that all street parking in the city is tallied and indexed in order to accurately match supply and demand. I see res. permits working better if residents can cashout their permits at market rate. On my last visit to NYC, just after the December blizzard, alternate parking rules were suspended. I was surprised to see many cars that sat, unmoved, for the entire week I was there. It would seem that these are cars unnecessary to daily life, unnecessary to the productivity of their owners. Would higher parking prices convince their owners to get rid of them? Could the space freed up be put to better use? J:Lai, what makes you think residential and commercial districts are separate? Seems to me that nearly all New Yorkers live within easy walk of commerce. On the rare times I’ve had a car, I often have found myself driving up and down residential streets looking for parking to go to the commercial strip down the street. Billy Gray: agreed, on both your accounts. Instead of our current choice of 2 hours limits or, effectively 72 or even 168 hour limits (until opposite side), how about some moderation, and 24 hour limits, for less-commercial and less-dense areas? That 98% doesn’t need 2 hour parking meters, but maybe it needs 5 or 10 or 20 hour meters. There is 0% chance there are 3.5 million spots in NYC. It’s topping out at around 1.5 million. I’m NOT seeing an estimate in the Weinberger study of 3.4 to 4.4 M on-street parking spaces in New York City. Can you point you point me to that estimate? Can you provide an explanation for how the estimate was made? So the estimate is not by Rachel Weinberger as you suggest, but by you. You estimate is Nspace = Mnyc * 5280ft/mile * Mparking / Lspace * 2, where Nspace is the number of parking spaces, Mnyc is the miles of road in NYC, Mparking is the percent with parking on both sides, Lspace is the length of a space in feet. And where do your estimates for the values of these come from? Where did you get 6,600 miles of road, where 90% with parking on both sides, where the length of a parking space? Also, how did you get 4.4 M for the higher estimate? If you assume everything is fixed (including the 90% value) you could get that by assuming there are rough 8300 miles or road, but that doesn’t seem right. There is a report from 2001 by The Center on Municipal Government Performance (which looks at road smoothness) that has totals for the miles by borough. The sum of the five is 5946.18. Manhattan is 508.38. Assuming your other values that would give 3.1 M for NYC, and ~268 k for Manhattan. can u please provide the source on the chart? My first complaint is that there are metered parking spaces on completely residential blocks that have no commercial businesses. Then I have to complain that there is alternate side parking for unnecessary street cleaning rules on the same type of street. So, how’s that for a new feather for your cap? Billy Grey: I 100% agree. I even like the goofy way you put it. AT NO COST????? Our tax dollars are not ‘at no cost’!!!!!! It is not a giveaway of public space. You are insane, I’m convinced. I don’t remember that blizzard, as NYC has gone through so much freak weather recently. I can tell you, though, that I and many others stayed home and didn’t go to work during the worst of it. Well, you could lengthen the time limit or lower the price to increase usage of on-street parking. No one benefits from multiple empty parking spaces left unused on a given block. Perhaps the abundance of spots also indicates very low market demand for spots on that block, and perhaps that could be used to argue for replacing some parking with a protected bike lane. However, one of the places I’ve seen plenty of open spots is by the First Avenue protected bike lane. are u a native american? The City can handle a lot more people. It can’t handle a lot more cars. NYC gives away free on street parking in residential neighborhoods to non-resident commuters and visitors. That’s crazy and encourages driving. We need residential permits like Boston, Albany, Philly, DC and others to reclaim scarce curb space for cycling and pedestrian infrastructure and for residents who need to own a car. Residents who need to own a car also need to pay the true price of storing it if they are going to do so on city streets. While long-term parking should come at a lower rate than short term hourly parking, there is no reason that street parking should be solely for residents at the expense of visitors and commercial vehicles who may need to travel by car. Since your tax returns don’t get checked before you park your car, the people taxed to pay for those parking spaces have little to do with who actually uses them. It’s a common resource that is being monopolized by a few at no additional cost to them … and for those who are visitors, no cost at all. Time limits help control what kind of trips are done by car and by transit. People with regular commutes are encouraged to either secure off-street contract parking or develop an efficient mass transit commute. On-street parking in busy commercial districts where metered parking is typically found is meant to serve quick stops at those businesses and not long-term car storage. As you note, if fairly-priced meters are empty much of the time, that likely indicates the parking is not needed, transit serves the area well, or there is simply a nearby much cheaper or free supply of parking that people are using instead. Variable-price parking (X during daytime, Y during evening hours) can improve utilization, but urban planners aim for a percent of open parking spots even at peak times. Time limits help those spots serve as many people as possible. I’ve ventured into NYC and even Manhattan as a visitor in a car a few times, and it has tended to be a huge hassle … between figuring out the side-of street parking restrictions … and occasionally sucking it up and paying out for a painful overnight in a garage. One trip the easier solution was to park at a lot in Hoboken and cross via PATH … the extra travel time was roughly the same as cruising for parking, while the PATH fare was a drop in the bucket compared to the price differential for paid parking. In general, the far better solution is to travel into the city by transit. Make it a short term metered spot. Those using it would pay. It could be the first step to introducing reasonable parking costs and taming the weirdness of urban NYC street parking. Of course, those buildings might not be happy with that prospect. Increasing the rate with duration of stay will help a lot, but it is still reasonable to have some spots which are guaranteed to regularly become available for new parkers who can do their business quickly and drive on. I think by the time you are spending more than a couple of hours someplace, you should be encouraged to think about solutions that involve parking in a garage or lot and walking several blocks to your destination … or traveling using mass transit or taxi/rideshare/bikeshare/other. If there is an area where street parking is regularly full, there is probably enough density of use to merit regular bus service. Just as we should discourage people from using easy-access convenient street parking for long-term storage of cars, if the garages are also regularly full, there should be frequent mass transit and encouragement of residents/workers to reconsider their use of a vehicle. As much as a street lined with jaguars would be cool, it’s also not the best use of public space, even if we are squeezing the real cost of it out of the owners. Metered street parking can still give residents preferential rates and can allow for long stays, if that’s what you want, but completely locking out visitors from being able to park is not the answer. Residents are in a much better position to decide to not keep a car than visitors, or to pay for long-term parking at a commercial parking structure. With modern electronic meters that are not tied to a single spot an print out parking permits, you can easily vend hourly, daily, weekly, monthly passes from the same machine. Give a discount if the payment card is registered to a resident. Mark every few spots as short-term parking to keep people from having to cruise. According to a senior municipal bond analyst at a leading Wall Street firm, New York City could raise between five and six billion dollars immediately if it privatized its parking meters as Chicago is doing. Whether privatization is the right way to unlock New York City's parking riches is debatable. What's not in question is that curbside parking in New York and most U.S. cities is grossly underpriced and could potentially be a crucial source of revenue for much needed transportation improvements.